Not a great deal to be seen today despite an obvious improvement in the weather. The best of the birds on the land were a few Goldcrests and two Firecrests and overhead passage included 12 Stock Doves, a late Swallow, 48 Chaffinches, eight Bramblings, 11 Redpolls, 130 Goldfinches and 18 Siskins. It was very quiet offshore. A Brown Hare and four Bank Voles were found. 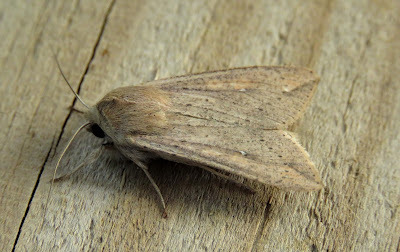 The moth traps were surprisingly productive for migrants overnight with six Dark Swordgrass and a White-speck of note. A fairly scarce migrant and the first at the Observatory since 2006.